STEVEN J FROMM & ASSOCIATES, P.C. Section 1231 of the Internal Revenue Code applies to and categorizes gains and losses from property used in the trade or business and from involuntary conversions. Any losses are treated as ordinary losses, taxable at more favorable ordinary loss rates, and available (without limit) to offset other ordinary income. What Qualifies For This Head I Win and Tails I Win Treatment? Recognized gains from the involuntary or compulsory conversion (into money or other property) of property used in a trade or business, or of property held for more than one year and either used in the trade or business or used in a transaction entered into for profit. Property used in a trade or business is property that is subject to depreciation and held by the taxpayer for more than one year. Code Sec. 1231 losses are any recognized loss from a sale, exchange, or conversion of the same categories of property. Gains and losses from these transactions are referred to as Code Sec. 1231 gains and Code Sec. 1231 losses. The character of the gain or loss depends on whether Code Sec. 1231 gains exceed Code Sec. 1231 losses for the tax year. If the Code Sec. 1231 gains exceed the Code Sec. 1231 losses, then all of the Code Sec. 1231 gains and losses are treated as long-term capital gains and losses. The result is a net long-term capital gain. This amount can then be netted with other capital gains and losses. If, however, the Code Sec. 1231 losses equal or exceed the Code Sec. 1231 gains, then all of the Code Sec. 1231 gains and losses are treated as ordinary income and losses. The net result is an ordinary loss, which can offset other ordinary income. Code Sec. 1231 does not apply to depreciation that must be recaptured as ordinary income under either Code Sec. 1245 (depreciable personal property and certain real property) or Code Sec. 1250 (depreciable real property that is not Code Sec. 1245 property). Hiring Steven was quite possibly the best decision of my life! Steven took the time to hear every single one of my concerns and address them in an extremely clear, concise and thorough manner. He guided me through the notoriously complicated and stressful process of probate with the utmost of compassion and dedication. Thank you Steven! I highly recommend Steven J. Fromm for all your estate and tax planning needs. He has the most complete and thorough knowledge of current as well as pending federal, state, and local tax codes of any professional that I have ever been involved with. His ability to totally sort out your current financial condition and relate it to a plan to minimize your tax liability and allow you to sleep at night is without equal. He is professional, timely, creative, and an advocate for your needs, whether its personal or business. You can be assured that you will be well taken care of, with cutting edge/ sound financial and tax advice by Steven J. Fromm. I have always found Steve to be very responsive, accurate and creative in legal matters presented to him. He demonstrates a good business sense. We have collaborated on several highly technical issues over the years. I look forward to our continuing relationship. Steven has been instrumental in helping my partner and I to create a secure and satisfying estate plan, which meets or exceeds all of our wishes and contains contingencies for everything from medical issues to wealth management and living wills. In this process, Steven has also become a friend. If you need Estate Planning, Tax Advice, a Will or a trust, etc., we highly recommend Steven Fromm, Esquire. He will listen and be sensitive to your unique situation. Steve is an excellent attorney who has provided help for my family personally for business, tax, and other services for many years. He is extremely knowledgeable and thorough, and is extremely good at explaining legal concepts to me in clear terms understandable to a non-attorney. It is difficult to pick only three attributes above, since Steve’s work meets most if not all of the attributes above. Steve is an excellent corporate attorney who has a deep understanding of corporate law, taxes and estate planning. He’s been extremely helpful to me in keeping my many companies and business ventures organized, focused and squeaky clean. He’s very strong in estate planning and wealth preservation as well. Finally, his follow through is air tight and utterly dependable. Steven is a trusted adviser. We depend on him for so many things. He is patient, listens to our needs and makes excellent suggestions. He is extremely talented. We value his advice and have recommended him unhesitatingly to friends and family. 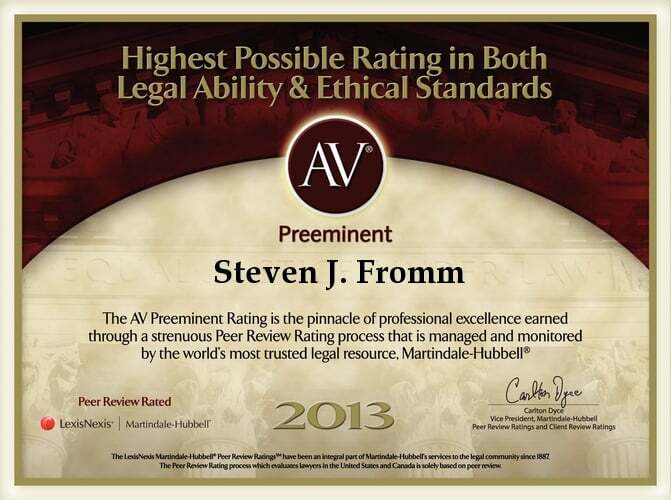 Steve Fromm is a superb lawyer and I highly recommend him! After a terrible experience with a previous lawyer concerning an estate administration, I entered his office feeling very deflated, confused and discouraged. However, I left his office feeling enthusiastic and eager to get down to business. My situation was very unique, I needed his expertise for an array of things and Steve was able to address all of my needs. With a limited timeframe and an extreme amount of obstacles to overcome he worked meticulously, diligently and accomplished extraordinary results. His professionalism is incomparable and I am forever grateful. Steven J. Fromm & Associates, P.C. Steven is fantastic and very personable. Supremely attentive to my needs, provided excellent advice and support, and demonstrated incredible knowledge of partnership agreements. In our first consultation he addressed complex issues that may arise down the road and how to keep my interests protected. I highly recommend engaging Steven Fromm as your corporate attorney. Steve was so helpful! I had a complicated question about settling an estate and Steve talked me through a variety of options. He's extremely knowledgeable and was willing to spend the time needed to help me understand the various actions I could take. In addition, he was friendly and sympathetic. I highly recommend his services. THE BEST OF THE BEST!!! After doing hours of research by speaking with attorneys, checking public records, and reading legitimate client reviews, I determined that Steven J. Fromme is the best attorney of his type in the Philadelphia area and one of the finest in the country. My subsequent personal experiences with him further proved my determination. He is not only a talented, knowledgable, honest, world class expert but he sincerely cares about his clients. He is definitely not the typical money-hungry sociopath masquerading as a caring lawyer. Notice that Mr. Fromm has a RARE five-star rating on Yelp, where it is almost impossible to post fake reviews. I have done your homework for you. You cannot surpass Mr Fromm. Very professional. Steve really works the best for his clients. I have referred several other businesses and they absolutely love them! I will keep referring others because my experience has been excellent. 5 stars for sure! Rest assured that we respect your privacy and will never share your information with any other parties. fill out the form and click “submit”. A representative of the firm will call you shortly. From their offices in Philadelphia, PA, the law firm of Steven J. Fromm & Associates, P.C. provides a full range of estate planning, probate and estate administration, tax, business and corporate legal services to clients throughout eastern Pennsylvania and the Delaware Valley, the Lehigh Valley Area, the Five-County Area, Bucks County, Delaware County, Montgomery County, Chester County, Philadelphia County, Berks County, Lehigh County, Lancaster County, York County, Harrisburg, Norristown, Doylestown, Media, West Chester, Allentown, Lancaster, and Reading.